"We've got a big announcement planned for next Thursday, April 21st. There're still some details to be ironed out, but you can think of it as an "unveiling", of sorts." "Unveiling." Unveiling of what, exactly? Well, that's the mystery. Methinks we'll be witnessing the first real footage of the game in action, which would seem to fall in line perfectly with a second helping of screenshots planned to be revealed by Eguchi shortly before the big announcement. In other Devroom news, Greg also spoke a little about some of the future Devroom developments. Coming soon, short videos showcasing games in the Legends series hosted by Director Eguchi and Producer Kitabayashi. 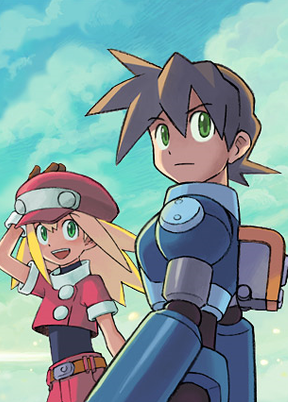 Mega Man Legends 1 and 2 will be featured (the former already up for viewing here), but The Misadventures of Tron Bonne, curiously, won't. Instead, Greg says "one other game you may find interesting" will be showcased in its place. Great Five Island Adventure, perhaps? It's canonical, after all, not like some of the other side-games in the series. We'll be keeping an ear out. This coming week certainly sounds like a big one for the Devroom.. I doubt it's actually gonna be a big deal. Looking forward to that present! I plan on being indignant if they showicase any of the games us westerners didn't get in overview. Worse yet if we're getting highlights in lieu of the game in anticipation for Legends 3 actively referencing it. This game has been canceled! Watch 'em unveil Zero as a main character and chaos summarily ensue in the Devroom.